With our sunny climate and general abundance of space, outdoor showers can be a great value-add to many a home. For those living on the coast and for those with pools or river or dam frontage they can be an attractive asset in an outdoor entertainment area. As an extension to an en-suite or guest bathroom outdoor showers can also ramp up the luxury factor and lifestyle points hugely. While many people ask themselves, especially as they return from holiday, why they don’t have an outdoor shower at home, the good news is they can be as affordable, simple and easy to create as you choose. Fancy a shower in an hour? 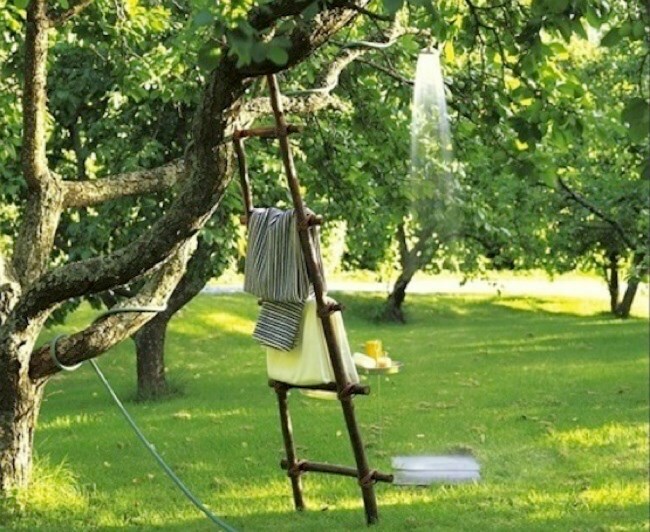 Try threading a hose through a tree or using a bracket to attach it to a wall, and adding a showerhead of your choice. Think kids on the lawn on a hot afternoon, surfers returning from the beach or sweaty athletes after a morning out. 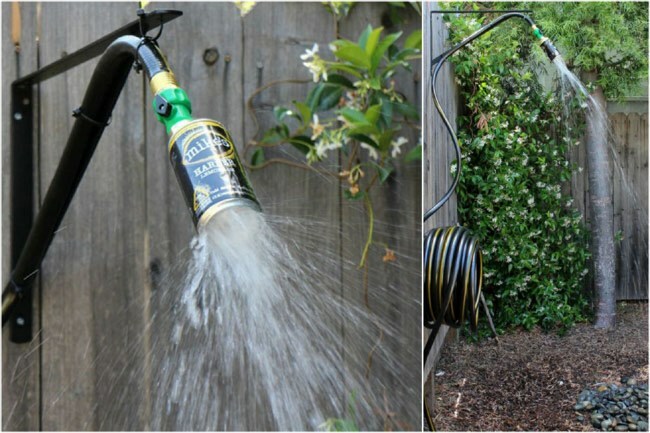 Leave the hose coiled in the sun, and you get warm water too! Here a beer can gives this shower a humourous twist. Whether you’d like to take advantage of a beautiful view or just want to capture a little vacation spirit, showering outdoors is a totally different experience, the fresh air around you making it doubly refreshing. Add some appropriate décor and you can create an “on location” feel right at home. By making an outdoor shower private, complete with doors and walls, you can actually use it as an everyday shower, giving your daily routine that much more appeal. Outdoor showers are a perfect place to rinse off after swimming. They also mean people don’t have to go dripping through the house! Add a bit of privacy and people can dry off and change there too. Whether it’s to clean up after gardening, rinse off muddy shoes, or rinse down grubby kids before bringing them into the house, an outdoor shower can be a great place for a quick wash after outdoor activities. Add a tap at the bottom for hands and feet, or a hand held nozzle which is also ideal for dog cleaning. During holidays and over weekends, many find their homes swell with extra visitors – especially when children hit the teens and early twenties. An outdoor shower can be just the spot to service some of the overflow when you home is suddenly overrun with others.